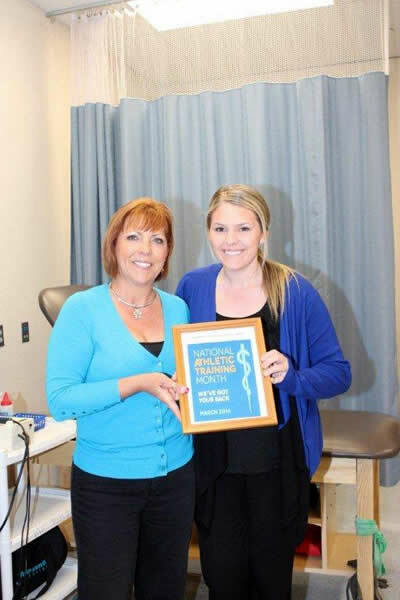 National Athletic Training Month was celebrated here at West Hills College Coalinga. The District representative of Senator Andy Vidak’s office, Francesca Dove visited to discuss the AB 1890 bill for State Licensure for Athletic Trainers. Needless to say she left here extremely knowledgeable about Athletic Trainers. Francesca did mention that she would be speaking to Senator Vidak’s Representative in his Capitol office this week to discuss the bill with him and that he would be presenting the information directly to the Senator. I feel great about today’s meeting and she was very receptive to our Bill and the situation we have in the State of California. And with the knowledge that it would not cost the tax payer anything was a high point.